WESTPORT, CONN. — Handwritten by the artist himself, a copy of Bob Dylan’s “Like A Rolling Stone” lyrics went out at $100,000, including buyer’s premium, in University Archives’ January 23 sale. 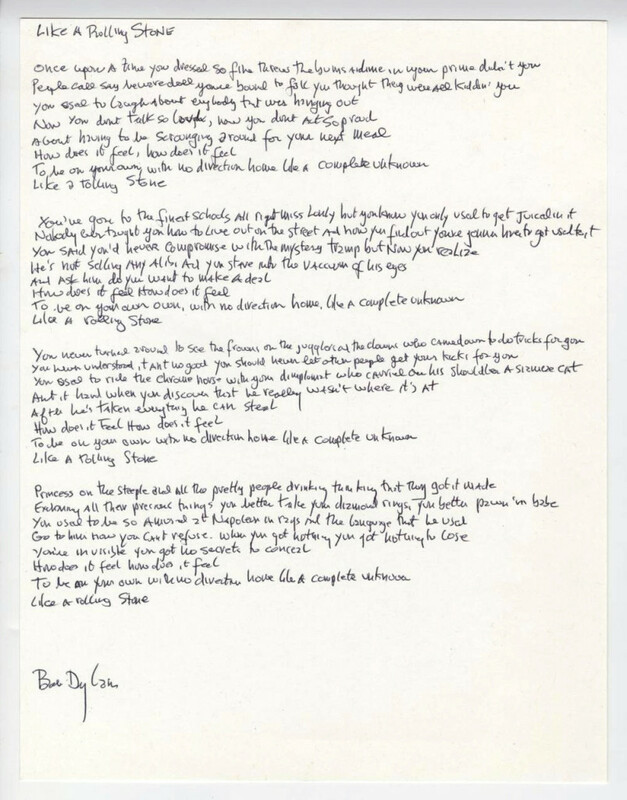 The single 8½-by-11-inch page is the only handwritten copy of the song’s lyrics to appear at auction. It was authenticated by Bob Dylan’s manager. “Like A Rolling Stone” was voted the number one song of all time by Rolling Stone magazine in 2004. For more information, www.universityarchives.com or 203-454-0111.